Notes: Yilankale (Turkish for "Snake Castle") is a late 12th-13th century Armenian castle in Adana Province of Turkey. It is known in Armenian as Levonkla after its founder-King Leo (Levon) I the Magnificent (r. 1198/9-1219) of the Armenian Kingdom of Cilicia. It is located on a rocky hill overlooking the east bank of the Ceyhan River, six kilometers west of the town of Ceyhan. It is almost entirely built of well coursed squared, probably limestone, blocks. The castle contains a chapel. It is half-ruined with only two walls standing. According to information on the Cukurova University website, the castle was abandoned during the reign of the Ramadanids in the mid-14th century. 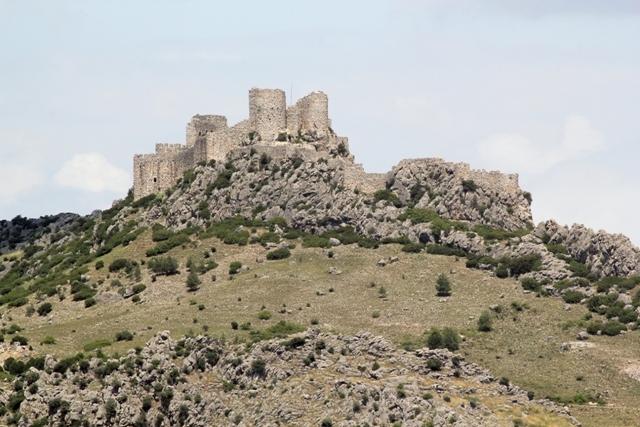 It has been described as the "most perfectly preserved Armenian castle" of the Cukurova (Cilicia) region. The castle is open to the public and was renovated in summer of 2014.